The Cuevas del Indio Recreational Park, better known as Guairita, is a limestone hill, which has a number of caves, which gives it its name. It also has rock walls where you can practice rock climbing. 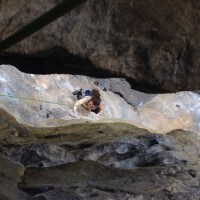 Due to its location and amenities, it forms an oasis for practicing rock climbing, as well as being on the outskirts of Caracas, has a lot of routes equipped, at all levels for this sport.